The luxury version of the Classic Bullet. The luxurious Classic Bullet by Je Joue is the perfect product for experimenting pin-point sensations. 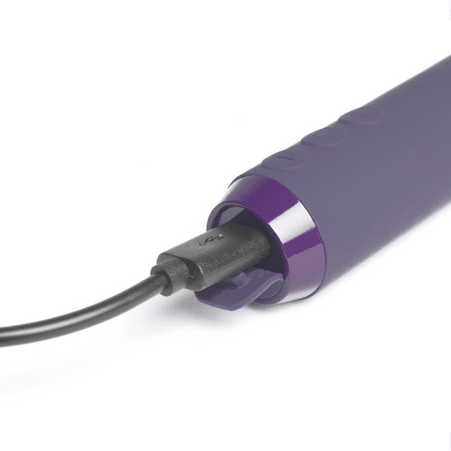 With 5 speeds of vibration and 7 different pulsing vibrations, the Classic Bullet hosts a range of sensations from gentle to deep. The Classic Bullet is a soft, smooth silicone tipped toy which comes with a free finger sleeve, allowing for a hands-free experience during your play time. By simply slipping the Classic Bullet into the sleeve, you or your partner can explore greater sensations, either hands-free or maintaining that skin to skin contact. To switch on the toy, simply hold the + button for 2 seconds. To increase vibrations, press the + button until you have reached your desired level. To decrease the levels of vibration, press the – button. To change vibrations from constant to pulsing, press the middle button. To turn off, hold the – button for 2 seconds. To charge your Je Joue Classic Bullet, lift the silicone flap and plug-in the micro USB cable. The toy charges for 1 hour and allows for 1.5 hours of play time. The Je Joue Classic Bullet is truly a seamless, easy-to-use product for anyone wanting to spoil themselves with some pleasure. Classic Bullet by Je Joue	Overall rating:	4.8	out of 5 based on 16	reviews.